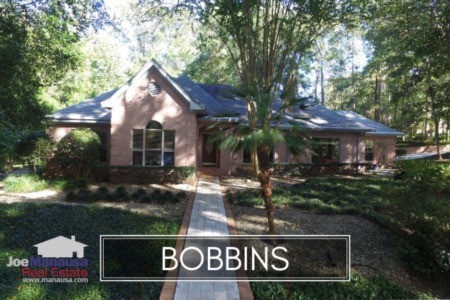 Bobbin Trace, Bobbin Mill Woods, and Bobbin Brook (the neighborhoods of Bobbin) are a trio of adjacent high end homes neighborhood located in Northeast Tallahassee. Here you will find some of the nicest offerings in our housing market, and it remains a buyer's market. Currently, there are nine homes for sale with just two under contract, and just one sale posted since our last report three months ago. This means only 3 homes have sold in the Bobbin neighborhoods through the writing of this report in early October, and that means some of these sellers should be getting ready to make adjustments. In our last report on the Bobbin neighborhoods, I suggested some sellers would be making changes, and they did. Joe Manausa Real Estate sold one home in the Bobbins during that time, and now two other sellers are under contract. The good news for high end home sellers is that there remains high demand for luxury homes, but the bad news is that many of this demand is seeking new construction or fully modern homes. All the construction in the higher price ranges is only adding to the woes of sellers who just want to get sold and move on. The following list of homes are the most recent listings in Bobbin Trace, Bobbin Mill Woods, and Bobbin Brook. It is important to note that the narrative contained below is for sales through December for all previous years, but through September in 2016. 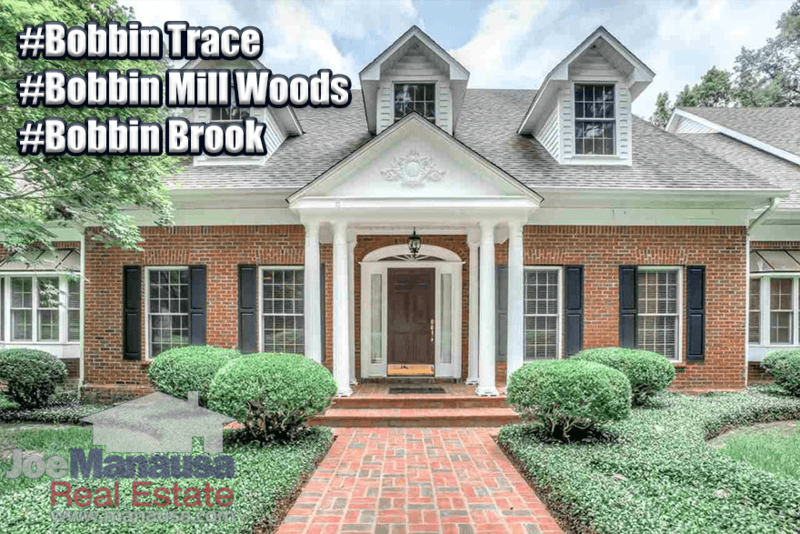 The graphs and the closed sales table will be continuously updated into the future (meaning bookmark this page if you always want to know the current status of homes in Bobbin Trace, Bobbin Mill Woods, and Bobbin Brook). With only three homes sold so far in 2016, the average sales price has been $693,000. The median asking price for those on the market is $750,000, indicating a potential disconnect between what sellers want and what buyers are willing to pay. Expect motivated sellers to bring down their asking prices to get these homes sold. They will need to re-assess their asking prices and make corrections (if necessary) to consider the improvements buyers will want to make for a the home (buyers want modern, but they won't pay to modernize a home only to be in it at market value, right?). For activity to return to the Bobbins, sellers are going to have to do something to attract buyers. Location is a big draw, but apparently not as big as the current asking prices require. These sellers will need to do something to entice buyers or there will continue be a log jam of homes for sale in the Bobbins. With nine homes on the market and only three homes sold in 2016, the inventory appears to be enough for several years of demand. I wonder how many of the existing home sellers are planning to wait several years to sell their homes? Bobbin neighborhood home values fluctuate greatly due to low liquidity (few sales each year). While we can track values over time (like in the graph below), ultimately we must look beyond this one neighborhood to give these property owners a better feel for appreciation levels that they should expect. As with every price range and neighborhood, we look to supply and demand to forecast the future. 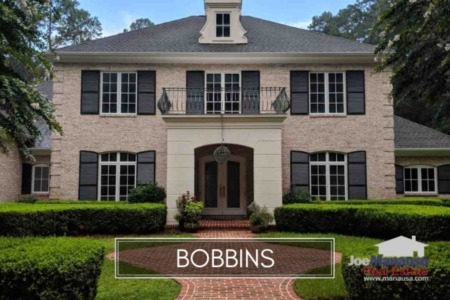 Currently, the 9 homes for sale in Bobbin Trace, Bobbin Mill Woods, and Bobbin Brook collectively are far more than the market is demanding. Considering the strong rate of sales last year to support the desirability of this area, I suspect it means these current sellers have priced themselves out of the market. The three home sales this year in the Bobbins sold for $170, $152 and $211 per square foot respectively. To command the higher value, the home must be fully upgraded with today's amenities. This means seller's have a cost-benefit decision to make ... improve the home or lower the price. Many will be tempted to pursue the former, but prudent sellers will choose the latter. The average home size sold in the Bobbins typically falls in a range of 3,500 to 5,000 square feet, and the two sales this year were quite opposite. The 3 Bobbin neighborhood home sales in 2016 averaged 3,833 square feet. I hope you enjoyed our October 2016 update on home sales in Bobbin Trace, Bobbin Mill Woods, and Bobbin Brook, please feel free to drop me a note if you have questions not covered in this report.